Student’s learning potentials are effectively identified and guides the teaching learning process accordingly. The school refrains from ability based labeling and adopts universal design strategies for students for example whole class differentiation. The school makes all possible efforts to remove barriers that limit the learning experience of students of determination and integrates them effectively in the common learning environment. The school policies and systems are aligned to the Dubai Inclusive Education Policy Framework launched in 2017. We teach not for school but for life. We believe our children are talented and the pedagogic principles we apply must guide them to achieve their true potential. A good foundation is the key to success. We ensure our children have strong basics that will help them in their future endeavors. 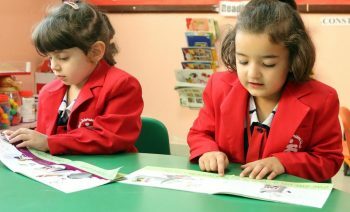 There are three stages to life at The Apple International School: Foundation Stage, Primary school and Middle school. For their earliest years, the students are encouraged to explore the huge range of educational opportunities available to them, to excel within realistic expectations and to discover individual strengths through a well- planned programme of sporting, cultural and social activities. Students at The Apple International School are multi- cultural and are guided to mix and to form varied friendships.Apple- ites as the students & staff are fondly addressed are provided with immense opportunities to grow emotionally, physically, intellectually and most importantly independently to foster high academic performance. The emphasis is on practical work. The teaching staff is committed to providing a happy, secure & supportive atmosphere to foster personal growth and high academic results. However, The Apple school offers far more than just academic excellence. 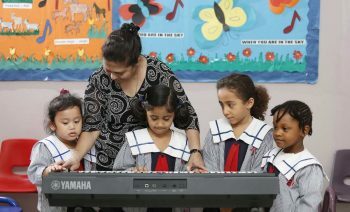 The range of extra- curricular activities is extensive and in the inter- school competitions, performing arts, drama, debates, sports and community service we have established a particularly enviable reputation. 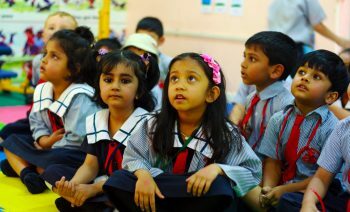 The compassionate and committed staff at all levels be it Foundation Stage, primary level or middle level offer a kaleidoscope of value based learning activities and healthy competition among students to instill confidence and to prepare them to face the challenges of future, to mould them into responsible world citizens. The challenge in academic life, for each student is to achieve their potential in all their subjects, to flourish in areas where they have a particular talent and to enjoy the learning process. We teach not for school, but for life. Everyone is physically and emotionally safe. Students develop self-esteem, confidence, creative expression and individual talents. Students take responsibility for their own actions and be lifelong self-directed learners. Students communicate effectively, work co-operatively as team players and show respect towards themselves, others and celebrate differences. Respect: For each other, resulting in the development of the organization we work for. Care: For each other, thus generating a feeling of camaraderie among the staff and students. Faith: In each other motivating us to work together towards a common goal. International Mindedness: In everything that we think and do, for the betterment of wider society. Care – For each other, thus generating a feeling of camaraderie among the staff and students. Faith – In each other, motivating us to work together towards a common goal. The pastoral support programme is a school-based and coordinated intervention to help individual pupils to improve their social, emotional and behavioural skills. As a result of this programme pupils should be able to better manage their behaviour and improve their overall skills. The pastoral life in the school is based on the ‘House’ system. With a view to foster a competitive spirit among its students, all students are divided into four ‘Houses’ i.e. Emerald, Ruby, Topaz and Sapphire. A number of Inter-House events that fill the calendar year cover the gamut of all sporting and literary activities. These activities become the ground work for competition at a higher level. This helps to inculcate a spirit of cooperation, healthy competition and develop loyalty both to the House and to the School. Each House is headed by a Captain and a Vice Captain, who work under the guidance of the Section Head.